Relation to Ab Bet Din. The president of the Sanhedrin. According to the rabbinical tradition (Ḥag. ii. 2; Peah ii. 6), the Sanhedrin was presided over by a duumvirate ("zug" = "zeugos" [couple]), of which the first was the nasi, the second the ab bet din. 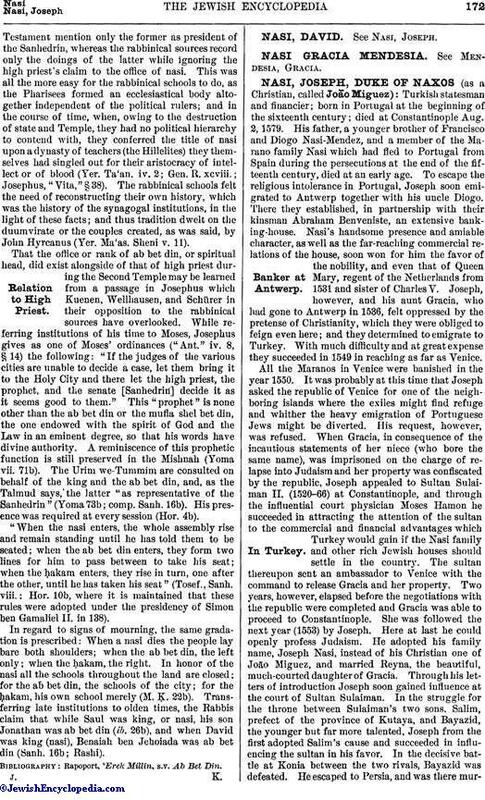 Jose ben Joezer and Jose ben Johanan in the time of the Maccabees are mentioned in the Mishnah as the first couple; Hillel and Shammai, as the last; while the two titles were conferred upon the two chief men of the Sanhedrin during the following generations, the house of Hillel down to Judah II. in 225 retaining the title of nasi, while as ab bet din, R. Joshua under the presidency of Gamaliel II. (B. Ḳ. 74b) is occasionally mentioned, and R. Nathan under Simon ben Gamaliel (Hor. 13b). The historic character of this duumvirate, and in particular that of the ab bet din alongside of the nasi as head of the Sanhedrin, has been questioned and even denied by modern writers, especially by Kuenen ("Ueber die Zusammensetzung der Sanhedrin," in "Gesammelte Abhandlungen zur Biblischen Wissenschaft," pp. 56-61), Wellhausen ("Pharisäer und Sadducäer," pp. 29-43), and Schürer ("Gesch." ii.203), but it has been defended by D. Hoffmann ("Oberster Gerichtshof," pp. 31 et seq.). The former point to the fact that neither Josephus nor the New Testament bears any witness to the existence of a president of the Sanhedrin other than the high priest, while Hillel and Gamaliel appear only as elders without higher rank. Hoffmann insists on the indisputable historical character of such mishnaic records as Eduy. v. 6. "We shall appoint thee ab bet din if thou wilt recant," the elders said to Akabiah ben Mehalalya (from the report concerning the election of Hillel as nasi in Tosef., Pes. iv. 2; and from the letter of the president of the Sanhedrin decreeing a leap-year, written by Gamaliel I., in Tosef., Sanh. ii. 6). This contradiction between the rabbinical and the Hellenic sources, however, probably finds its solution in the meaning of the title Ab Bet Din. The title "nasi" (Lev. iv. 22; Ezek. xliv. 2-18; Ezra i. 8; comp. Hor. iii. 2), given to the political ruler of Judea, could scarcely be applied to the spiritual head of a religious body, such as the institution of the synagogue required, and a special name had to be created for it, especially at a time when the high priests had become more worldly in character and unfit to decide the religious questions of the day. The title "ab" = "father" thereupon suggested itself, it being the favorite name given in olden times to the head of a school (I Sam. x. 12; II Kings ii. 11, vi. 21) or of a gild (Gen. iv. 21), or to a spiritual adviser in general (Gen. xlviii. 8; Judges xvii. 10). It was also customary for the sage to address his hearers as sons, as is seen throughout the Proverbs and other books of wisdom. 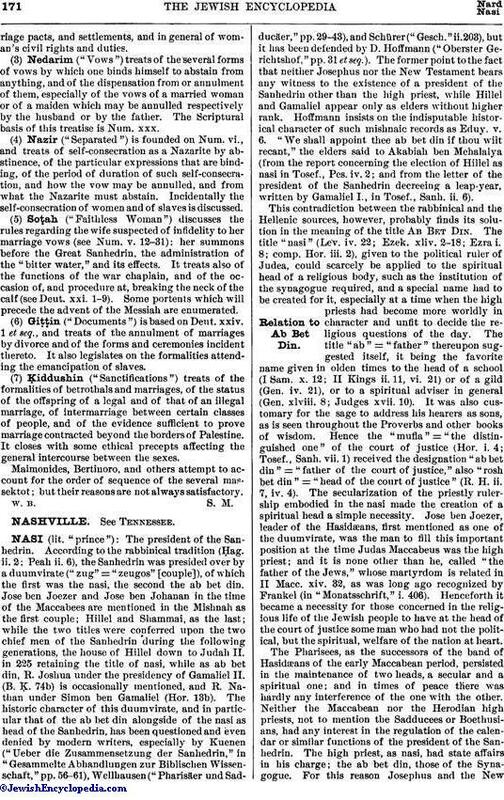 Hence the "mufla" = "the distinguished one" of the court of justice (Hor. i. 4; Tosef., Sanh. vii. 1) received the designation "ab bet din" = "father of the court of justice," also "rosh bet din" = "head of the court of justice" (R. H. ii. 7, iv. 4). The secularization of the priestly rulership embodied in the nasi made the creation of a spiritual head a simple necessity. Jose ben Joezer, leader of the Hasidæans, first mentioned as one of the duumvirate, was the man to fill this important position at the time Judas Maccabeus was the high priest; and it is none other than he, called "the father of the Jews," whose martyrdom is related in II Macc. xiv. 32, as was long ago recognized by Frankel (in "Monatsschrift," i. 406). Henceforth it became a necessity for those concerned in the religious life of the Jewish people to have at the head of the court of justice some man who had not the political, but the spiritual, welfare of the nation at heart. The Pharisees, as the successors of the band of Hasidæans of the early Maccabean period, persisted in the maintenance of two heads, a secular and a spiritual one; and in times of peace there was hardly any interference of the one with the other. Neither the Maccabean nor the Herodian high priests, not to mention the Sadducees or Boethusians, had any interest in the regulation of the calendar or similar functions of the president of the Sanhedrin. The high priest, as nasi, had state affairs in his charge; the ab bet din, those of the Synagogue. For this reason Josephus and the NewTestament mention only the former as president of the Sanhedrin, whereas the rabbinical sources record only the doings of the latter while ignoring the high priest's claim to the office of nasi. This was all the more easy for the rabbinical schools to do, as the Pharisees formed an ecclesiastical body altogether independent of the political rulers; and in the course of time, when, owing to the destruction of state and Temple, they had no political hierarchy to contend with, they conferred the title of nasi upon a dynasty of teachers (the Hillelites) they themselves had singled out for their aristocracy of intellect or of blood (Yer. Ta'an. iv. 2; Gen. R. xcviii. ; Josephus, "Vita," § 38). The rabbinical schools felt the need of reconstructing their own history, which was the history of the synagogal institutions, in the light of these facts; and thus tradition dwelt on the duumvirate or the couples created, as was said, by John Hyrcanus (Yer. Ma'as. Sheni v. 11). That the office or rank of ab bet din, or spiritual head, did exist alongside of that of high priest during the Second Temple may be learned from a passage in Josephus which Kuenen, Wellhausen, and Schürer in their opposition to the rabbinical sources have overlooked. While referring institutions of his time to Moses, Josephus gives as one of Moses' ordinances ("Ant." iv. 8, § 14) the following: "If the judges of the various cities are unable to decide a case, let them bring it to the Holy City and there let the high priest, the prophet, and the senate [Sanhedrin] decide it as it seems good to them." This "prophet" is none other than the ab bet din or the mufla shel bet din, the one endowed with the spirit of God and the Law in an eminent degree, so that his words have divine authority. A reminiscence of this prophetic function is still preserved in the Mishnah (Yoma vii. 71b). The Urim we-Tummim are consulted on behalf of the king and the ab bet din, and, as the Talmud says, the latter "as representative of the Sanhedrin" (Yoma 73b; comp. Sanh. 16b). His presence was required at every session (Hor. 4b). "When the nasi enters, the whole assembly rise and remain standing until he has told them to be seated; when the ab bet din enters, they form two lines for him to pass between to take his seat; when the ḥakam enters, they rise in turn, one after the other, until he has taken his seat" (Tosef., Sanh. viii. ; Hor. 10b, where it is maintained that these rules were adopted under the presidency of Simon ben Gamaliel II. in 138). In regard to signs of mourning, the same gradation is prescribed: When a nasi dies the people lay bare both shoulders; when the ab bet din, the left only; when the ḥakam, the right. In honor of the nasi all the schools throughout the land are closed; for the ab bet din, the schools of the city; for the ḥakam, his own school merely (M. Ḳ. 22b). Transferring late institutions to olden times, the Rabbis claim that while Saul was king, or nasi, his son Jonathan was ab bet din (ib. 26b), and when David was king (nasi), Benaiah ben Jehoiada was ab bet din (Sanh. 16b; Rashi). Rapoport, 'Erek Millin, s.v. Ab Bet Din.